1. Maximum number of students in a group is four (4). No less than 3,000 words assignment. 2. This assignment is to be submitted in accordance with assessment policy stated in the Subject Outline and Student Handbook. 3. It is the responsibility of the student who is submitting the work, to ensure that the work is in fact her/his own work. Incorporating another’s work or ideas into one’s own work without appropriate acknowledgement is an academic offence. Students should submit all assignments for plagiarism checking on Blackboard before final submission in the subject. For further details, please refer to the Subject Outline and Student Handbook. 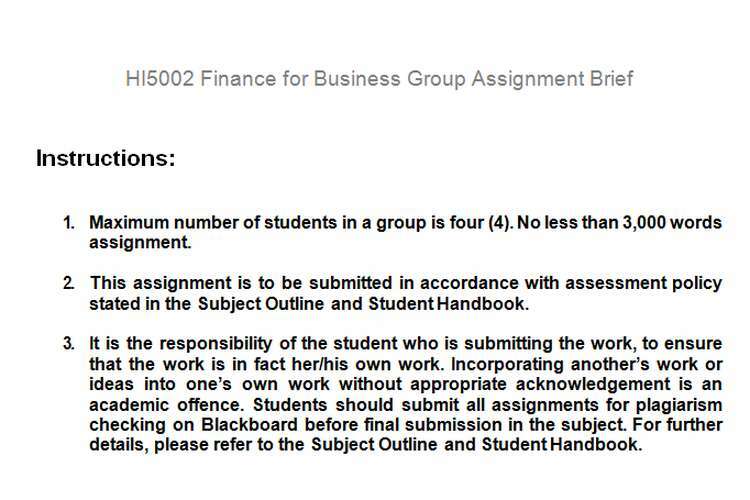 Only one member of the group shall submit the soft copy of the assignment in the Blackboard (BB). There are two links of submissions in the Assignments and due date’s content of your BB, the Group Assignment Self Check Link which is optional and the Group Assignment Final Submission which is Mandatory!!! Print the Safe assign report you have received after your submission to the Group Assignment Final Submission link. Attached the safe assign report and the printed assignment to the Assignment cover sheet. For Melbourne campus please drop your assignment to the designated assignment boxes inside the library level 1 from 08.30am to 05.00pm. For Sydney and Brisbane campuses please ask your lecturers. 6. NO extension is to be granted because you have enough time to complete the tasks. Do not email the assignment to your respective lecturer because it won’t be marked by the lecturer. Only those students who follow the instructions will receive their marks. Emu Electronics is an electronics manufacturer located in Box Hill, Victoria. The company’s managing director is Shelly Chan, who inherited the company from her father. The company originally repaired radios and other household appliances when it was founded more than 50 years ago. Over the years, the company has expanded, and it is now a reputable manufacturer of various specialty electronic items. Robert McCanless, a recent MBA graduate, has been hired by the company in the finance department. One of the major revenue-producing items manufactured by Emu Electronics is a smart phone. Emu Electronics currently has one smart phone model on the market and sales have been excellent. The smart phone is a unique item in that it comes in a variety of colours and is pre-programmed to play Jimmy Barnes’s music. However, as with any electronic item, technology changes rapidly, and the current smart phone has limited features in comparison with newer models. Emu Electronics has spent $750 000 developing a prototype for a new smart phone that has all the features of the existing one, but adds new features, such as Wifi Tethering. The company has spent a further $200 000 for a marketing study to determine the expected sales figures for the new smart phone. Emu Electronics’ production manager has produced estimates of the costs associated with manufacture of the new smart phone. Variable costs are estimated at $205 per unit and fixed costs for the operation are expected to run at $5.1 million per year. The estimated sales volume is 64 000 units in Year 1; 106 000 units in Year 2; 87 000 units in Year 3; 78 000 units in Year 4; and 54 000 units in the final year. The unit price of the new smart phone will be $485. The necessary manufacturing equipment can be purchased for $34.5 million and will be depreciated for tax purposes over a seven-year life (straight-line to zero). It is believed the value of the manufacturing equipment in five years’ time will be $5.5 million. Net working capital for the smart phones will be 20% of sales and will have to be purchased at the end of the year. The cost of the raw materials is reflected in the variable unit cost. Changes in NWC will first occur at the end of Year 1 based on the first year’s sales. Emu Electronics has a 30% corporate tax rate and a 12% required return. How sensitive is the NPV to changes in the price of the new smart phone? How sensitive is the NPV to changes in the quantity sold? Should Emu Electronics produce the new smart phone? Suppose Emu Electronics loses sales on other models because of the introduction of the new model. How would this affect your analysis? You have recently been hired by Hubbard Computer Ltd (HCL), in its relatively new treasury management department. HCL was founded eight years ago by Bob Hubbard and currently operates 14 stores in the South Island of New Zealand. HCL is privately owned by Bob and his family, and had sales of $9.7 million last year. HCL primarily sells to in-store customers who come to the store and talk with a sales representative. The sales representative assists the customer in determining the type of computer and peripherals that are necessary for the individual customer’s computing needs. After the order is taken, the customer pays for the order immediately, and the computer is made to fill the order. Delivery of the computer averages 15 days, and it is guaranteed in 30 days. HCL’s growth to date has been financed by its profits. When the company had sufficient capital, it would open a new store. Other than scouting locations, relatively little formal analysis has been used in its capital budgeting process. Bob has just read about capital budgeting techniques and has come to you for help. For starters, the company has never attempted to determine its cost of capital, and Bob would like you to perform the analysis. Since the company is privately owned, it is difficult to determine the cost of equity for the company. Bob wants you to use the pure play approach to estimating the cost of capital for HCL, and he has chosen Harvey Norman as a representative company. The following steps will allow you to calculate this estimate. Most publicly traded corporations are required to submit half-yearly and annual reports to the ASX detailing the financial operations of the company over the past half-year or year, respectively. These reports are available on the ASX website at www.asx.com.au or in the investor section of the company’s own website. Go to the ASX website and search for announcements made by Harvey Norman. Find the most recent annual report or half-year report and download the report. Look on the balance sheet to find the book value of debt and the book value of equity. If you look in the report, you should find a section titled ‘Interest Rate Risk Management’, which will provide a breakdown of Harvey Norman’s long-term debt. To estimate the cost of equity for Harvey Norman, go to http://au.finance.yahoo.com plus the business section of www.smh.com.au and enter the ASX code for Harvey Norman, HVN. Follow the various links to answer the following questions—What is the most recent stock price listed for Harvey Norman? What is the market value of equity, or market capitalisation? How many shares does Harvey Norman have outstanding? What is the most recent annual dividend? Can you use the dividend discount model in this case? What is the beta for Harvey Norman? Now go back to http://au.finance.yahoo.com and find the ‘Bonds’ link. What is the yield on government debt? Using the historical market risk premium, what is the cost of equity for Harvey Norman using the CAPM? You now need to calculate the cost of debt for Harvey Norman. Go to www.westpac.com.au and find the current business loan rates equivalent for each of Harvey Norman’s debts. What is the weighted average cost of debt for Harvey Norman using the book-value weights and the market-value weights? Does it make a difference in this case if you use book-value weights or market-value weights? You now have all the necessary information to calculate the weighted average cost of capital for Harvey Norman. Calculate the weighted average cost of capital for Harvey Norman using book value weights and market value weights. Assume Harvey Norman has a 30% tax rate. Which cost of capital number is more relevant? You used Harvey Norman as a pure play company to estimate the cost of capital for HCL. Are there any potential problems with this approach in this situation?